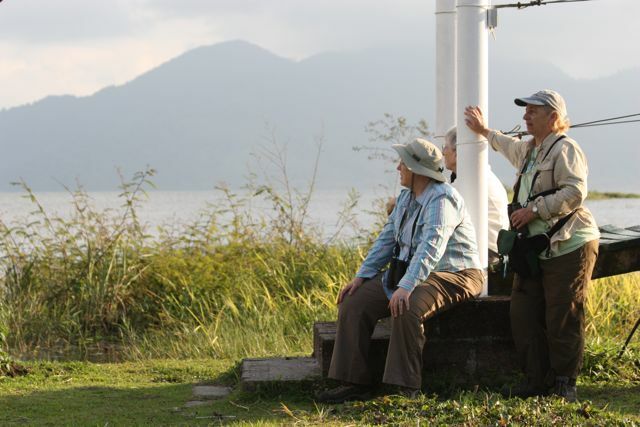 How Do You Say Jacana? A yellow canna in the gardens along Lake Yojoa. Ahh. One of my favorite photos from the trip: three Connecticut birders, set down in Paradise. Corey Finger and I were very impatient with the weather, so we decided to go sit under the canopy of a pontoon boat moored nearby and see what we could see. Of course, it's probably pointless to even bring one's camera, but what the heck. I can still enjoy a purple gallinule as interpreted by Monet. 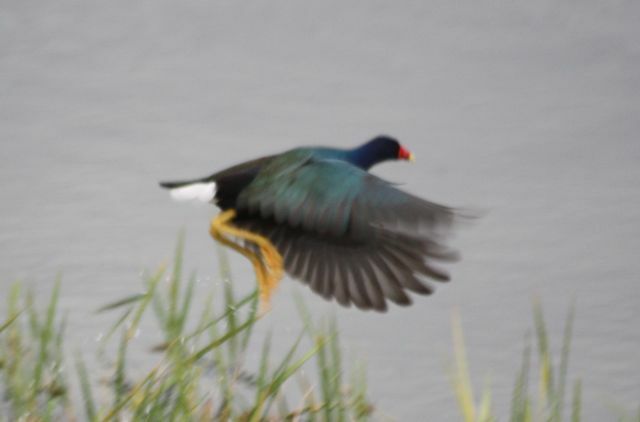 Purple gallinules really don't look like they should be able to fly. I mean, what do they do with those huge yellow feet? Corey is almost as bad a Science Chimp as am I, and we were consumed with curiosity as we watched a green heron repeatedly attempt to behead a small snake, which looked poisonous to me. Well, I wouldn't want to swallow venomy fangs whole, either. He about had the head off by the time he flew away with it.You'll notice that he's carrying it well back from the head, by its tail. 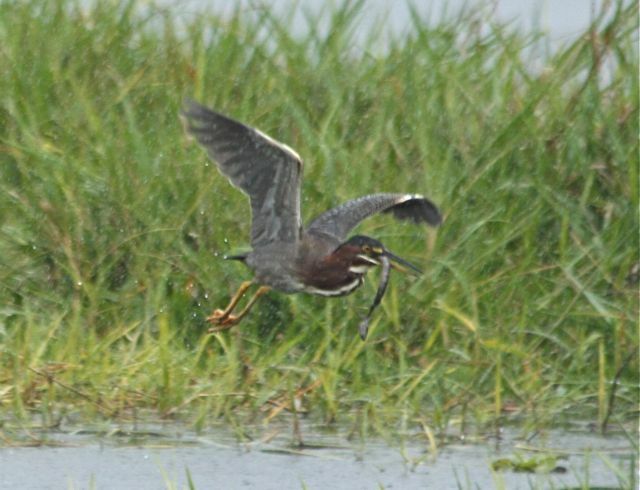 Almost any time you see a heron with prey other than a (presumably venomous) snake, they'll carry it by the head. That's the business end, and if you have control of that you have control of your prey. So I found it interesting that he carried it by the tail. 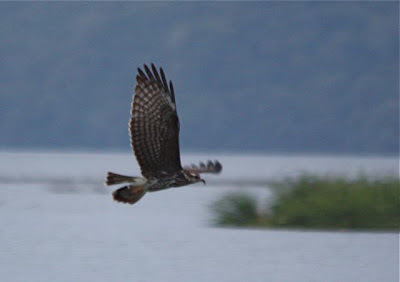 I leave you with yet another crappy bird in zero light shot--a snail kite. Endangered in the US, probably mostly because we just don't have that much habitat for it. Phoebe found a nice juvenile that looked just like this at Viera Wetlands, during the Space Coast (FL) Birding Festival, a bit of an unexpected record, but the wetlands are full of apple snails, and that's what the kite needs. 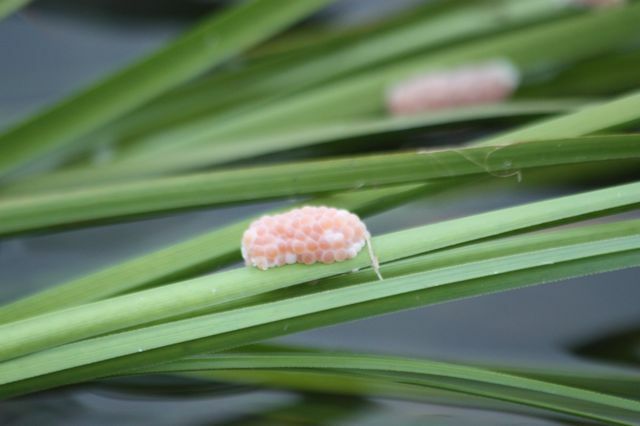 Just to prove I am capable of taking a decent photo when it's not pouring, here are some apple snail eggs. They taste like strawberries. I made that up. Going for it during the rain beats sitting inside anyday. The exotic is just different enough in structure that the adult kites can deal with it, but juveniles have a much harder time shucking the meat out of the shell.